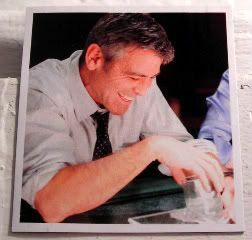 Lest ya'll think that I favor David over George, here's a magnet of my absolute favorite scene from Up in the Air. C'mon, who doesn't love a man with an easy smile? A George magnet and a magnetpost with absolutely no real content whatsoever. What? I was gonna do this whole thing about the movie and rant about the hard decisions being made, the sucky conversations that people have to go through, the terribleness of the times, the high rate of unemployment, the rugs being pulled out from under people, etc., etc. But you know what? It's a magnetblog. And sometimes, you just gotta take time to look at the cuteboys.